The first two parts of this guide provide a basic overview of the competitive Pokemon metagame. This part focuses on more advanced aspects of the metagame, which includes predictions and various scenarios. Please note that these ideas will be based on my experience combined with some research. I am not an elite Pokemon player. There are many, many players that are much better than me. However, I do have sufficient knowledge of the metagame and tons of experience. At my peak, I generally win around three out of four games. My friend and I used to battle all the time, and I would win most of our matches. He would get upset by the fact that I would go for “obvious” attacks all the time. Consider the following scenario: I have an Infernape out against my friend’s Breloom. He also has a Swampert that he can easily switch into, which I can 2HKO with Grass Knot. With this knowledge, I decide to use Fire Blast. My friend stays in and gets OHKO’d. This would anger my friend all the time. He would always call me a “noob” that always uses the most obvious attack as I proceeded to beat him. However, if my attacks were so obvious, why was he not able to predict them? The reason being is that I would simply predict him to over-predict, a term used when somebody goes too in depth into a situation and discounts the more simple possibilities. In the previous scenario, he believed that I would go for Grass Knot predicting Swampert. Therefore, he stayed with Breloom to survive the Grass Knot and OHKO Infernape. Of course, I predicted this and went for Fire Blast, the attack that is seemingly obvious. It is for reasons such as this that I like to call it “The Predicting Game.” At the end of the day, it is simply a psychological battle. Technically, there is no such thing as predictions. Somebody can simply predict higher or predict lower in an endless loop of predictions. For instance, what if my friend predicted that I would predict him to stay with Breloom, and therefore switch into Swampert on my Fire Blast. What if I predicted that, and went for Grass Knot? That is the point, predictions are not a sure fire thing. However, there usually is an attack that is the best option in most situations. 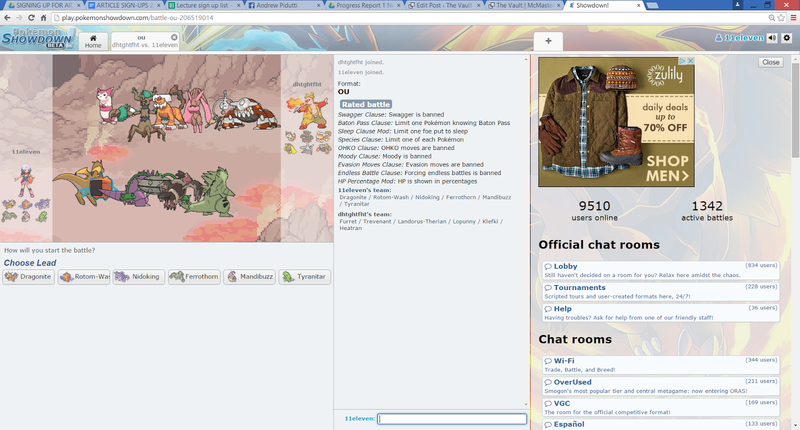 The Team Preview is a game mechanic introduced in Generation V. This is how the team preview looks on Pokemon Showdown, a competitive battling simulator. Pokemon Showdown is incredibly fun as it allows for battling without breeding in-game, which is not covered in this guide. In general, for the team preview, the player should be trying to decide who the opponent will lead off with and choose a Pokemon that can counter it. Many players’ first priority when starting a match is to put Stealth Rock on the opponent’s field. As a result, it is usually effective to choose a Pokemon that will counter the opponent’s Stealth Rock user. For instance, in a recent UU match, I observed my opponent’s team (Beedrill, Noivern, Suicune, Whimsicott, Doublade and Donphan) and decided to lead with Blastoise. I made this decision as he was likely to pick Donphan, a common Stealth Rock user. I was correct and, as a result, began the game with momentum. U-Turn is generally a useful early game for scouting purposes as well as gaining switch initiative and racking up Stealth Rock damage. It is usually effective to use safe choices early on in a match. For instance, I was recently using a Blastoise against an Empoleon during the first turn of a match. I decided to make the safest play and use Aura Sphere. I did not know how my opponent plays and making a prediction that early would have been extremely risky. When making decisions, a cost-benefit analysis is always useful. I could have predicted him to switch into his Serperior, thereby switching into Infernape. This is an overprediction, and in most situations, it would result in a KO’d Infernape. The risk of switching into Infernape outweighed the benefit; it was not a good decision. My choice of Aura Sphere was correct, he did not switch and I proceeded to 2HKO him. Near the end of the game, it is important to use the information that you have gathered throughout the match. Analyze the opponent’s playstyle early and mid-game to outsmart them late in the match. A player from Smogon University named Caelum provided a useful scenario that explains how a player can use the opponent’s playstyle to his advantage. 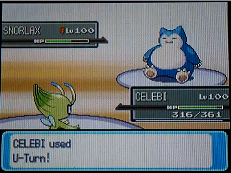 Early in the game, he had a Celebi with U-Turn and Leaf Storm against a Swampert. Thinking his opponent would make the safe play and switch, Caelum decided to use U-Turn to gain leverage. However, his opponent stayed in to outpredict him. Caelum used this information later in the match to his advantage. He had a Choice Banded Herracross that was locked into Close Combat against a Gengar. The obvious move for Caelum would have been to switch into Blissey and take minimal damage from Gengar’s special attacks. However, Caelum used his knowledge early in the game, where his opponent was trying to out-predict him, to stay in and use Close Combat. His opponent, predicting Caelum to switch into Blissey, switched into Dugtrio, which got OHKO’d by Close Combat. This is a perfect example of how the opponent’s playstyle can be used to your advantage. This wraps up the final part of this Overview of Competitive Pokemon. I hope it was enjoyable and a little informative!